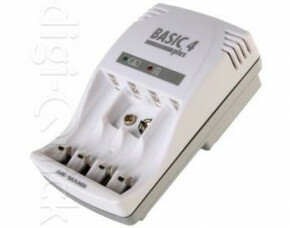 The Ansmann Basic 4 Plus has four charge NiCd / NiMH batteries of AA / AAA, or a 9V block battery. The Ansmann Basic 4 Plus is a standard plug-in battery charger suitable for charging 1-4 pcs of NiCd / NiMH batteries of AA / AAA, or a 9V block. Features of the Ansmann Basic 4 Plus battery charger include charging indicator, reverse polarity control and automatic matching of charging current. - Universal Plug-in charger for 1-4 AA or AAA cells as well as 1 x 9V block - Automatic matching of charging current - Reverse polarity control and charging indicators for cylindrical cells and 9V Charging currents are as follows: AA = 150mA AAA = 50mA 9V = 15mA.